We believe in creating a better world, and as part of that mission we’ve teamed up with the Breast Cancer Research Foundation to release a special charity skin in Overwatch: PINK MERCY! Available for purchase in-game and online through May 21, all sales of this limited-time legendary skin will benefit BCRF and their mission to end breast cancer. But this isn’t the only way to show your support! We’ve also created a limited-edition Pink Mercy charity shirt, unleashed a unique collection of Pink Mercy sprays and player icons you can get as Twitch Drops, and rallied an epic team of Overwatch content creators to stream for the cause. As a brilliant scientist and the guardian angel of Overwatch, Dr. Angela Ziegler—codename Mercy—has dedicated her life to helping and healing others. Now you can help BCRF work toward a cure for breast cancer by purchasing the new PINK MERCY skin, available for a limited time on PC, PlayStation 4, and Xbox One. 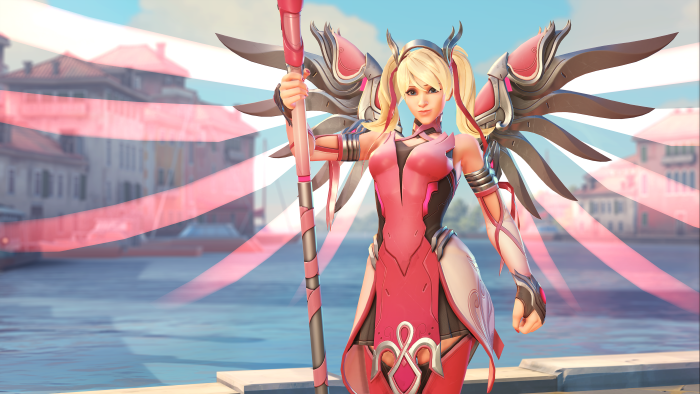 Blizzard Entertainment will donate 100% the proceeds that it receives from all Pink Mercy skin sales to BCRF, with a guaranteed minimum donation of $250,000 (USD). The total donation amount will be disclosed after the campaign concludes on May 21. Please visit our shop page for more details. Show your support on and off the battlefield with a new, limited-edition Pink Mercy charity shirt. Designed by community artist VICKISIGH, 100% of the proceeds from these t-shirt sales will be donated to BCRF. Head over to the Blizzard Gear Store to learn more and pre-order yours today! Log in to Overwatch any time between May 8 and May 21 and unlock a BCRF-themed player icon! We've also partnered with community artist ONEMEGAWATT to create a series of themed Twitch Drops, including a new player icon and four all-new sprays. Available only during this event, you can earn these special Pink Mercy cosmetics by viewing select streams on Twitch during the two-week promotional period. IMPORTANT: To be eligible to receive Pink Mercy Twitch Drops you must first link your Blizzard account to your Twitch account. Visit the Twitch Connections page to log in and complete the link now. Pink Mercy Twitch Drops will be available May 8–21 on select Twitch channels—see the full list of participating channels below. For more information on Twitch Drops, click here. Over the next 14 days, a cadre of content creators from across the globe will be streaming Overwatch under the pink-ribboned banner of breast cancer research. On designated days, each creator will host a dedicated charity stream on Twitch, and all donations (including Twitch Bits) received during that specific stream will be sent to BCRF. 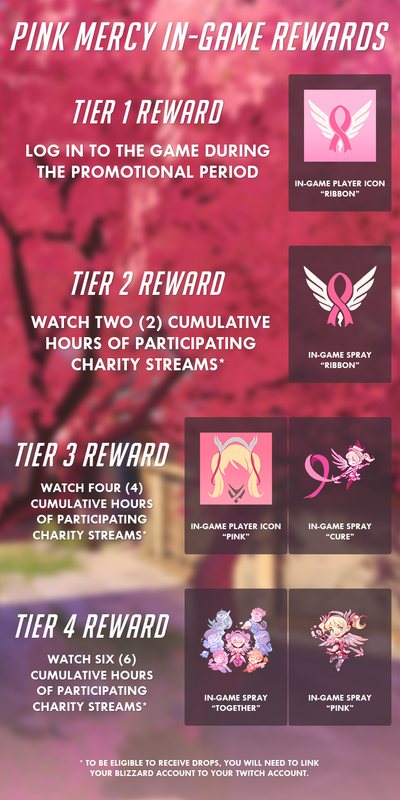 In addition to streaming for charity, these channels will also have Pink Mercy Twitch Drops enabled any time they stream Overwatch from May 8 to May 21. See above section for details. And last but not least: Don't forget to show you care with a little flair! Through May 21, amp up awareness for the cause on Twitch with our BCRF- and Pink Mercy-themed global emotes. The Breast Cancer Research Foundation (BCRF)’s mission is to advance the world’s most promising research to eradicate breast cancer. For more information about BCRF, visit bcrf.org.